Today I'd like to introduce Vivian Chen, who will be guest posting on PhotoMint from time to time. Vivian is a long-time studio assistant for several well known San Francisco photographers. Her roles include second shooting, editing and color correcting, album design, customer service and studio operations. Because she is familiar with the inner workings of some of the best studios in town, she knows how to streamline day to day operations to keep everything working smoothly. In her free time, she works at building her own photo business. PhotoMint readers, please give Vivian a warm welcome by sharing your thoughts in the comments below. As a second shooter, your job is to be back up to the main photographer. An effective 2nd shooter is one who can balance understanding what the main photographer is expecting while also having enough initiative to capture moments on your own. What do I tell my clients? How to make it work financially? How long can I shoot for? How long after the birth before I should plan to shoot again? How do I nurse at weddings? We'll get to all those questions and more. We've got a big wedding coming up this weekend, and that means we have some preparation to do in order to be ready for the weekend. We go through this routine every Friday afternoon, or the day prior to the wedding. It's critical to have a routine that you follow each time. That way you know you're covered. 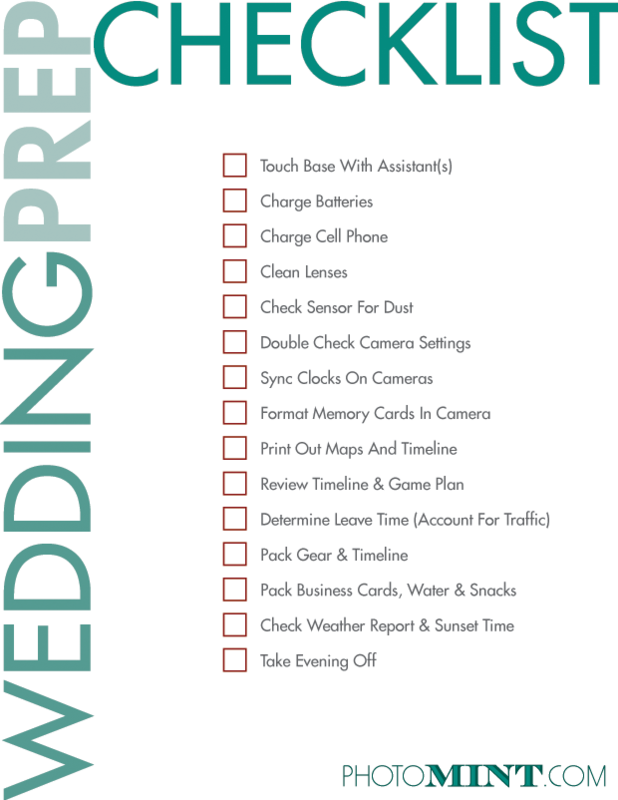 Follow our wedding photography checklist and you will be well prepared on your upcoming wedding shoot. 1. Clean the Gear -Geoff goes through each piece of equipment, cleans dust out of the lenses, checks the camera body, makes sure everything is in good working order. Every lens gets cleaned. You don't want some pesky dust spot on every image. 2. Charge the Batteries-We always carry extra flash batteries, you never know if you'll need it or end up with a dead battery.